Well, New Zealand, you certainly lived up to your expectations once again. We are finally home after a 3 week family vacation to Hong Kong and New Zealand. Home, complete with 7 cases and 7 pieces of hand luggage that are all mercifully now unpacked, washed and dried (one of the many benefits of year round sunshine). Our time in New Zealand was spent enjoying the best of the country's food, wine and beautiful scenery. For Matt this was a trip back home which means that our trip benefited from a little local knowledge. After a few days finding out feet in Auckland; days filled with family dinners, catch-ups with friends and other admin that goes with a return home after a 2 year absence, we headed south. South, to the North Island volcanic plateau and Taupo (pronounced tow-poor); all 7 of our cases neatly stashed in the back of our hire car, we headed to what I would have to say is one of the most beautiful places on earth. The Huka Lodge was our home for the 4 days we spent in Taupo, providing us with an exceptional base from which to explore the area. We stayed at this magnificent hotel in 2014 when we were last in NZ and have longed to be back there again it totally captured our hearts. We had talked of returning there before we had even left last time. And upon our return it certainly did not disappoint. 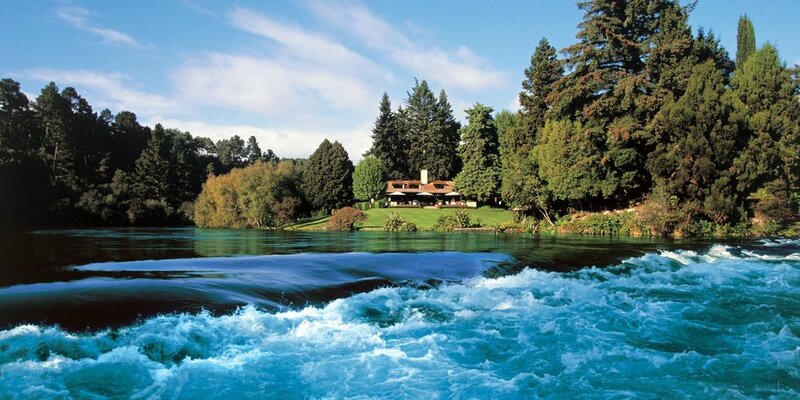 The hotel is nestled in what can only be described as breathtaking scenery on the Waikato River (New Zealand’s longest). The natural environment is stunningly beautiful. 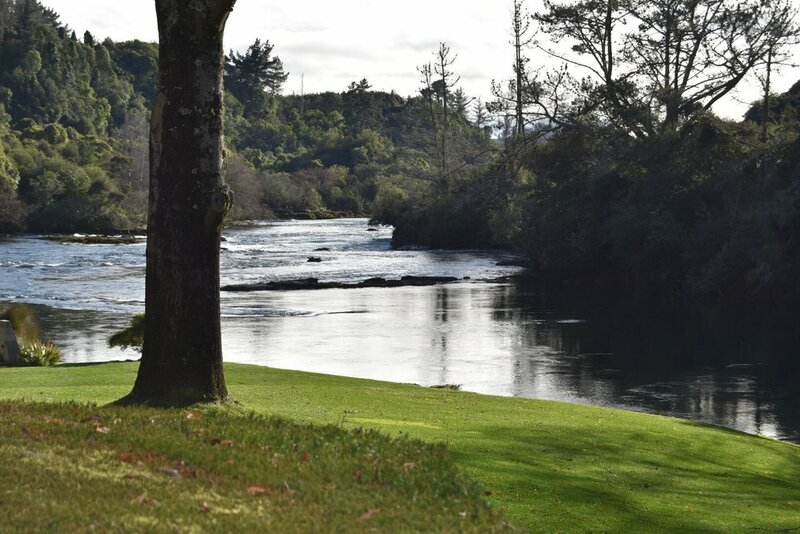 So crisp and clean, especially in the middle of the New Zealand winter, you are immersed in colours of emerald green, deep teal blue of the river waters and deep green and warm brown of the surrounding cliffs and trees on the banks of the river and the hotel ties into the environment perfectly. The place draws you into the environment. The hotel is a lodge in that true sense of the word. It has 20 rooms; two “cottages” as well as the main lodge building. Warm, with fires and beautiful artwork everywhere you look, it feels like a Scottish highland hunting lodge, overlaid with 5-star luxury from top to bottom. For our stay this time we pushed the boat right out and stayed in the Alan Pye Cottage on the property – an exceptional self-contained house – for all 4 days. Words are not able to describe quite how nice-a place this is. It was heaven. Log fires everywhere, heated floors, a beautiful lounge, a private heated pool in the garden overlooking the river, a private hot tub, and outdoor lounge and fireplace and scenery that takes your breath away every time you see it. I feel totally blessed to have experienced such an amazing place and am so thankful to my better half for working so hard to make sure we have the very best of everything. The food and wine at the Huka Lodge were superb; faultless. Each evening the chef prepared an individual 5 course meal which was explained to us by the amazing staff who finished each explanation by telling us that we could also have anything we wished that was not on the menu. For a girl who can at times be quite particular about menu choices, I was in heaven. We were treated each night by the best food and wine that New Zealand has to offer and it was exceptional. the magnificent Huka falls. Located not far from the Huka Lodge, the falls left me amazed by the awesome power and beauty of nature. The Waikato River at the point of the falls is channeled into a narrow canyon as it drops condensing the power of the river into a confined space. The result is a roar of crystal powder blue water; so coloured by the minerals from the adjoining Lake Taupo and the volcanic geology of the surrounding area. The striking beauty of the central North Island volcanic plateau and seeing the 9snow covered ,200 foot Mt Ruapehu, flanked by the perfect cone of Mt Ngauruhoe. When you see these mountains you immediately realise why and how this part of the world gained so much fame as middle earth in the Lord of the Rings. It can only be described as unique and breathtakingly beautiful.